Nitish Kumar's decision to back the BJP's presidential nominee has seriously dented the Bihar "Mahagatbandhan" or alliance that he formed with Rashtriya Janata Dal leader Lalu Yadav in 2015. When Ram Nath Kovind takes his oath as the 14th President of India, the VVIP attendees will include Bihar Chief Minister Nitish Kumar. Sources said that when the Chief Minister called the President-elect on Thursday to congratulate him, he was invited to the ceremony on July 25 and confirmed he will be there. The count-me-in will inject new tension to the relationship between Nitish Kumar and his allies, Bihar leader Lalu Yadav and the Congress party. The Chief Minister ignored their advice and strode away from a front of 18 opposition parties he had helped assemble to announce last month that he would support Ram Nath Kovind, who was the government's candidate. He said the Congress had mismanaged the task of shortlisting the opposition's candidate, and, in any case, he approved of Ram Nath Kovind's credentials. 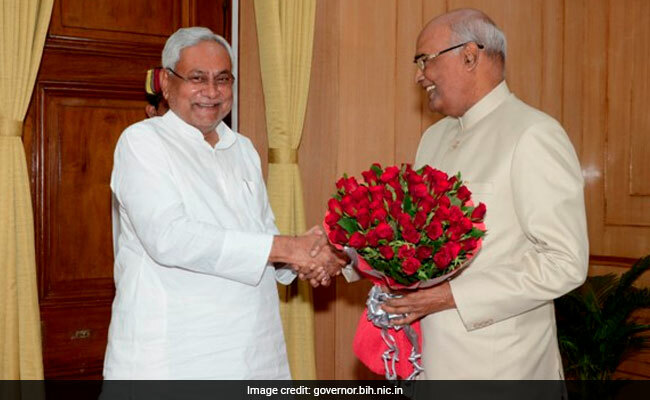 The 71-year-old who is a Dalit from Uttar Pradesh worked for three years with him as Bihar Governor and displayed the impeccable neutrality required of his office, Nitish Kumar argued. But his endorsement of the BJP's choice was seen as reflective of a growing chumminess with the party and with Prime Minister Narendra Modi, whose shock notes ban in November provoked ferocious opposition from all major non-BJP leaders barring the Bihar Chief Minister, who declared it essential in fighting corruption and black money. Nitish Kumar's equation with Lalu Yadav in particular had plummeted over the last few weeks with the latter's son, Tejashwi Yadav, being accused of corruption by the CBI. The Chief Minister hinted it was incumbent upon Tejashwi Yadav, 28, to resign as his deputy. The Yadavs vetoed that suggestion. The Congress appears this week to have mediated a fragile peace with Tejashwi Yadav meeting the Chief Minister two nights ago with a detailed defense against the CBI charges. Nitish Kumar and his party have not offered any comment on the meeting, reinforcing the assessment that they remain uneasy with the Yadavs as partners and that any accord is unlikely to remain binding for very long. Nitish Kumar's stepping out of the opposition line-up comes as several law-makers broke with their parties to back Ram Nath Kovind, who defeated the opposition candidate Meira Kumar, with nearly 65 per cent of the vote. The cross-voting is being seen as an indicator of the challenges to opposition unity as it strategises to collectively take on the Prime Minister in 2019.